If your vehicle has a Powerlet socket, it is Powerlet Equipped. Since one Powerlet outlet can do it all, Powerlet Equipped vehicles have the largest variety of cables available. Select from the following direct power cables and adapter cables. 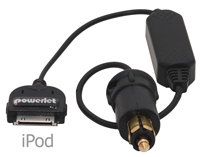 Powerlet manufactures direct power cables for Apple iPod (shown), mini-USB devices, Garmin GPS units, radar detectors and many other appliances. These cables plug directly into your Powerlet socket and directly into your appliance without using an adapter. Just another benefit of being Powerlet Equipped. To find the correct cable select the appliance from the drop down list below. Used to power or charge many cell phones, PDA's, GPS units and more. 500mA maximum. Powerlet to coax adapter cables for heated clothing are here. Powerlet to cigarette socket adapter cables are here. Powerlet to SAE adapter cable for battery charging is here. Powerlet to SAE adapter cables for heated clothing are here. Powerlet to SAE power cables for Luggage Electrix are here. In addition to Powerlet Equipped cables, we also manufacture adapter cables for SAE, coax, and cigarette power outlets. These adapter cables improve the flexibility of the outlets by converting them from one type to another. For instance Powerlet makes Coax to SAE adapters so older heated gloves can be plugged into a newer coax heated jacket liner. Powerlet makes a complete line of SAE adapter cables so you can use your SAE battery harness lead for more than just battery charging. For instance the SAE battery harness lead can be converted to a cigarette socket to charge a cell phone. Our SAE adapter cables are here. SAE to Coax adapter cables for heated clothing are here. Our Coax cables are mostly used for heated clothing and can be seen here. If the vehicle has a cigarette socket and you wish to convert it to a Powerlet socket look here. If you wish to convert to a SAE connector look here. Also see the appliance manufacturer for the correct power cable. 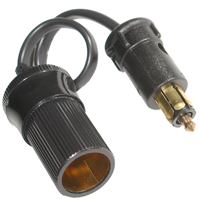 Do you have a Powerlet, Cigarette, Coax, or SAE power outlet on your vehicle? If your vehicle does not have a power outlet, please use our Shop By Vehicle navigator for the outlet that is best for your application.